I still remember my first mountain bike ride. It was back in 1985 at my local BMX shop. The owner showed us the new bike he just got, a big-wheeled, fat-tired bike with low gearing. Our small-wheeled BMX bikes were limited to firmer terrain, and you had push them up the steeper hills. I pedaled this mountain bike around the back lot, through the soft sand, and over curbs and obstacles. Terrain that would’ve brought my BMX bike to an immediate halt. Although almost silly by today’s standards, this early mountain bike seemed like it could go anywhere. My mind raced with all the new possibilities, and I knew I had to have one. I’ve been hooked on mountain bikes ever since. Every few years new innovations come along that expand the domain of mountain bikes. 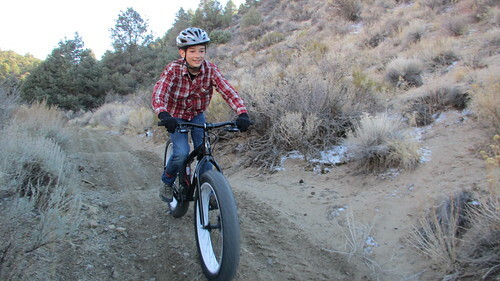 In recent years the Fat Bike movement has been growing. Initially designed with the frozen frontier in mind, small builders began experimenting with giant wheels and tires that would enable riding on snow. 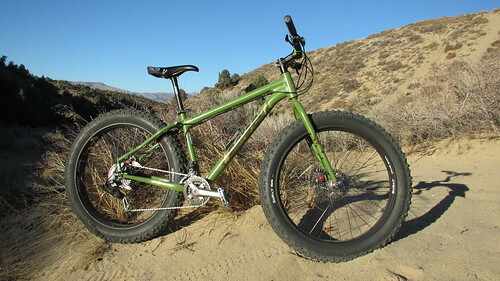 Since these wide wheels wouldn’t fit in a standard mountain bike frame, new frames and forks had to be built. Taking the design and concepts from these small builders, Surly Bikes became the first company to mass produce these fat bikes. 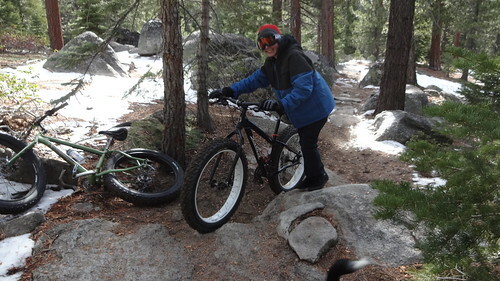 Once thought of as primarily snow bikes, riders have been experimenting in a wide variety of terrain and finding that the fat tires work great in other places we hadn’t considered riding before. 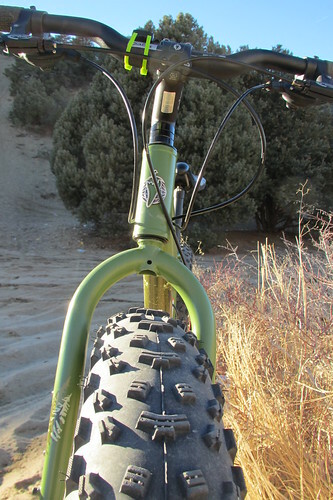 Today a number of companies have jumped on the bandwagon, and it seems like almost all the major manufactures have recently come out with their own take on the fat bike. 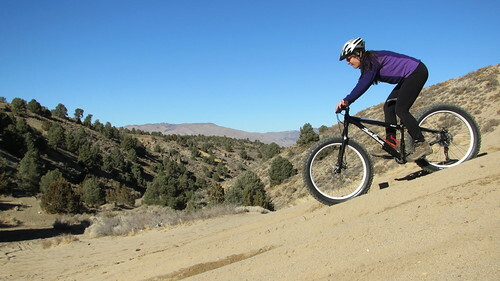 A few weekends ago, the Bike Habitat in Carson City let us demo a couple Mukluk fat bikes from Salsa Bicycles. Test riding the bikes in the parking lot before loading them up took me back to 1985 and my first mountain bike experience. Looking down at those huge tires got the gears turning in my head, and I started thinking of all the new places I could go on this bike. With limited time to ride the bikes, I wanted to take them somewhere I wouldn’t typically go, and not just the usual trails. 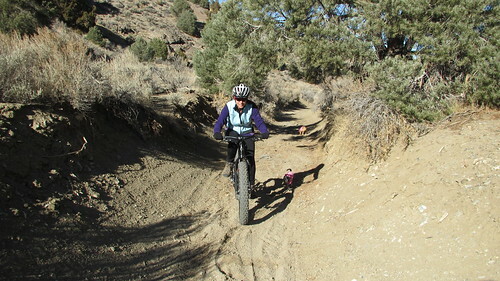 Located east of Carson City is Sand Canyon, a small canyon off of Brunswick Canyon. A sandy, twisty, off-camber jeep road climbs the canyon, and the road is bordered by numerous sand washes made by heavy rains. There’s even a sand dune partway up the canyon. It’s terrain suited for ATVs, and definitely not the first place you’d think to take your mountain bike. 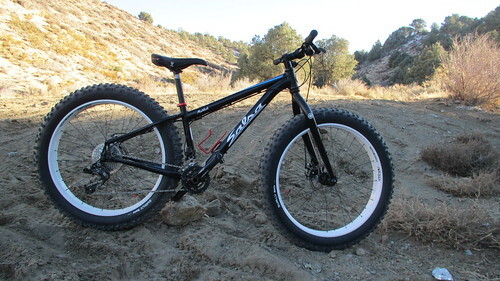 But for this test, it’d be the perfect place to demo these fat bikes. We shuttled the bikes to the mouth of Sand Canyon. I took the medium, and my wife took the small. My son brought his regular mountain bike along too, and it served as a good comparison. Our friends brought their four-seater ATV, and took off ahead of us. Immediately leaving Brunswick Canyon, the road turned sandy. My son left a wiggly track behind him as his body and bike fought to keep balance in the soft terrain. The fat bikes simply floated over the sand, tracking straight and true. We didn’t even need to ride fast to get the front tire on top of the sand. We could definitely feel that we were pedaling 36 lb bikes, but our bodies were relaxed. It made pedaling these big bikes a pleasant experience. On a regular bike, the terrain we were riding would force you to seek out the firmest ground to maintain traction and conserve energy. On the fat bikes though, we were riding anywhere we wanted. We left the road frequently to explore the sand washes. 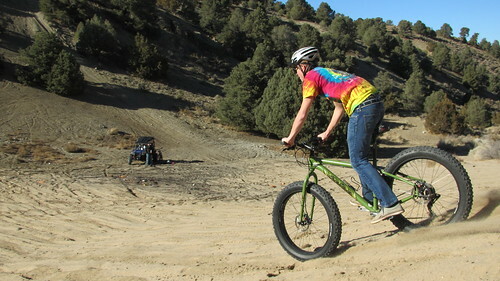 We aimed the bikes for sandy climbs and tall berms, and the bikes went wherever we pointed them. To be fair, we swapped bikes occasionally, so nobody was permanently stuck on the skinny tired bike. We eventually came to the big sand dune hill. This big hill can only be climbed on foot or on an OHV with a lot of horsepower. The sand proved to be too deep and soft here to make much progress on the bicycle, but I suspected we could ride down it. I pushed my bike about halfway up the steep hill and looked nervously down the slope. At least it’d be pretty soft if I went over the handlebars. I jumped onto the saddle, clipped into my pedals, and let the brakes out. Wow. I flew down the hill with control to spare. It was so much fun that we took turns pushing the bikes up the hill and riding down. 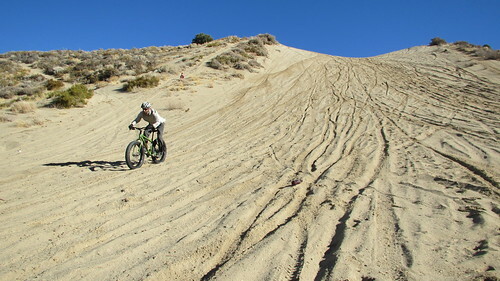 Just past the sand dune, we took the bikes up an even smaller side canyon. 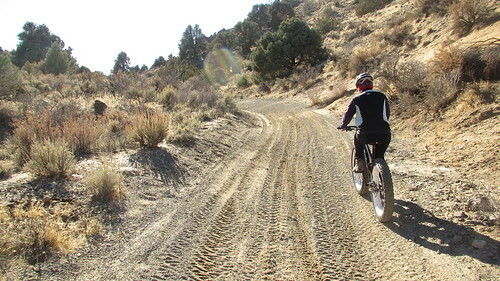 The narrowness of the trail permits mostly two-wheeled travel, and the terrain is a mix of sand, firm dirt, and rocks. 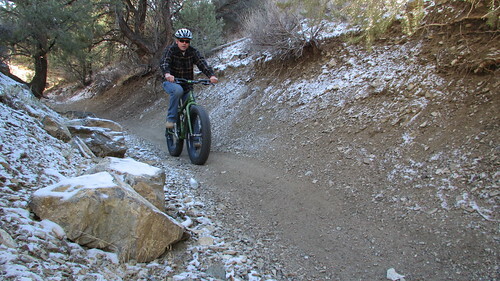 The fat bikes were a lot of fun here as well. No matter what terrain I was on, the rear wheel never spun out. The power in my legs would give out before the traction. Coming back down the narrow canyon was good test of the bike’s agility. The low pressure tires (we were running less than 10 psi!) are the only suspension on these bikes, and they absorbed the small bumps great. The overall diameter of these wheels, including the tires, is 29 inches. These tall wheels also help to smooth out the rough terrain. For such a big bikes, they proved to be fun for fast technical riding as well. The mechanical disk brakes, got the bikes slowed down in a hurry when we needed it. After we were done exploring, it was time to bomb back down Sand Canyon to the vehicles. The grade of the canyon is just steep enough to get some good speed without having to be on the brakes all the time. The long descent had many opportunities for fun. We dived in and out of the sand washes. Rode the top of the six foot high berms. Used our momentum to fly up and over hills. We arrived at the bottom with big smiles. 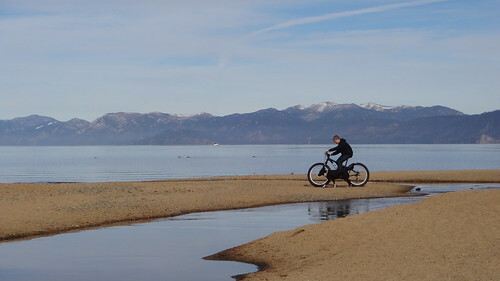 The next day I delivered the demo bikes to my friend Marcus who planned to test them out in a different environment up at Lake Tahoe. Here’s what he had to say. one handed with the camera. The design of the bike basically made the shoreline seem like a paved bike path. We were hummin along right at the beach! It was very fun. 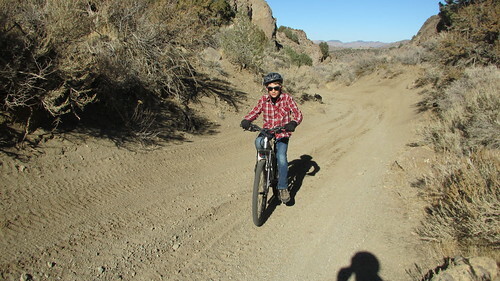 Next we took them to my favorite mountain bike trail, the Corral Loop… We had to climb up the paved road first. It was no problem. The road had some snow on it and we moto’ed right up it. On the way down the big berms were fun to hit in the snow. If I was on my normal mt. bike I am certain it would have been dicey. The fat bikes made it really easy and fun. Basically, these bikes are all terrain cruisers. They were easy for my 13 year old boy, who is not a huge cyclist, to ride down a snowy technical trail, and on the beach. Here’s a great video Marcus put together of his ride! Check out the full specs of the Salsa Mukluk 3 and other models at the Salsa website. Live in the Carson City area? Go check out the Mukluks at the Bike Habitat. For a look at the history of fat bikes, here is an interesting documentary.